$6.00 each plus S/H. If you require expedited shipping, please contact us at sales@musiatry.com. Note: Payments are processed through PayPal™ and a PayPal™ account is not required to pay - only a credit card is required. S/H charges for international orders will not be displayed in your shopping cart. S/H charges for international orders will be calculated and emailed to you after submitting your order. 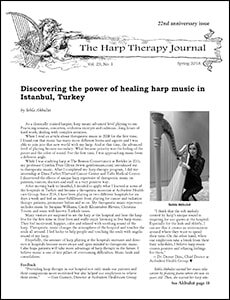 Akbulut, S., Discovering the power of healing harp music in Istanbul, Turkey. Barthel, M. Creative Arts Team receives NH Governor’s Award for Arts in Healthcare – Therapeutic harpist Margaret Stephens among recipients. Brockow, H. R., Back in action – Preventing therapy harp-related injuries. Schwartz, S., The power of ancient Greece and the wondrous journey of becoming. Stowe, K., VAHT provides stress reduction for staff at Bon Secours DePaul Medical Center. Williams, S., Music for Sleep. Williams, S., Sweet Dreams (music). Anderson, N.E., Playing from the heart. Barber, R. & Lewis, F., In memory of Gail Barber. CymaScope Lab., Testing a Pythagorean 2,500-year old hypotheses: Music can be used in the place of Medicine* - Promising initial results. Maserati, S., Sailors of Sound. 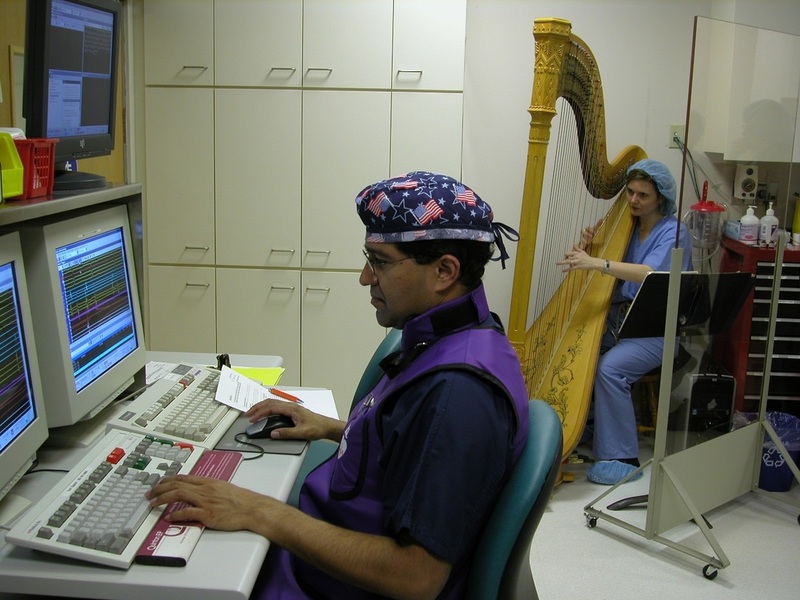 Saunders, D., Therapeutic harp music makes a larger difference than we might ever know. Stoll, S., NSBTM Promotes professional standards. Williams, S., Self-care for the body-harp. Williams, S. The VAHT Home Study Training Course announces new graduates. Carpenter, C. & Elkan, E., To soothe the savage breast: Music therapists and harp therapists at a psychiatric facility. Obermeyer, J., It’s all about the patients, isn’t it? 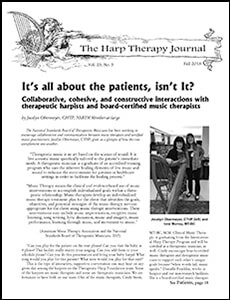 Collaborative cohesive, and constructive interactions with therapeutic harpists and board-certified music therapists. Wake, C., I am who I am (poem). 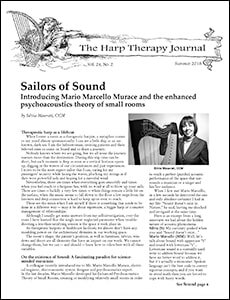 Clarke, J., The story of Harpo II for therapeutic harps. Marie, L., VAHT and warts? Why not!. Martin, J. 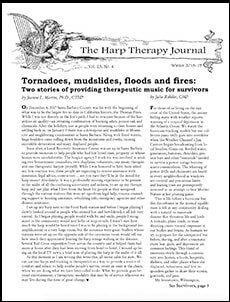 & Rehder, J., Tornadoes, mudslides, floods and fires: Two stories of providing therapeutic music for survivors. Middleton, C., New Australian Therapeutic Harpists Association formed. Obermeyer, J., It’s a first for the therapeutic music world! Stoll, S., NSBTM Update: Setting standards for CEU. Williams, S., An interview with Mary Stevens. Williams, S., Interspecies communication: Vibration, sound and music – the universal language.